METAMORA, IL - Taylor Camp and Bri Williams scored goals for Metamora (2-1-0) (0-0-0). Again. 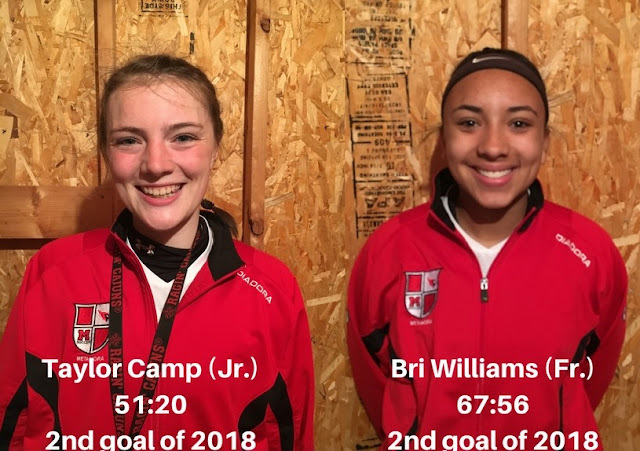 After a 2-1 win over Bloomington Central Catholic just nine days ago, Camp and Williams found the net again, and Metamora would hand the Richwoods Knights (3-1-0) (0-0-0) their first loss of the 2018 season, winning 2-0. The game got off to a slow start for both sides, as Metamora was only out-shooting the Knights at halftime, 3-1. Metamora Head Coach Danny Driscoll says that, in part, it had to do with a group of new players on this year's team. "We're inexperienced. We had kids playing in different positions. It's been hard to bring in new kids and get them to work well together, because they just don't have a lot of soccer experience." In fact, at the half, neither team was able to make all that much noise inside the 18, with a 0-0 score at halftime. In the second half, Richwoods was able to get off a few more shots, but Metamora keeper Alana Terry stopped all of them. Camp was able to rifle her goal in at the 51:20 mark of the game, her second of the season, putting the Redbirds up 1-0. It took just over 15 minutes, but Williams, just a freshman, would beat the defense, then the Richwoods keeper to get her second goal of the season as well, scoring at the 67:56 mark to set the final score of 2-0 in favor of Metamora. After the game, Coach Driscoll acknowledged that it was good that his team was able to get a game in considering the weather conditions this season. "It was nice to get another game in. Everybody's had problems because of the weather. It's been a freak season, getting eight inches of snow less than a week ago, it just doesn't happen this late in the year. The good thing is we're away from home for 10 or 14 days, so the field will hopefully get back in shape." Driscoll did acknowledge that there's pros and cons to situations with the weather such as this. "You just deal with the weather. It's not bad playing in the weather, the worst part is tearing up your field and you've still got a whole season to go." After the win, the Redbirds take a five-day break until their next game, not playing until a Tuesday kickoff on April 3rd against rival Washington. Start time is scheduled for 6:30 pm.